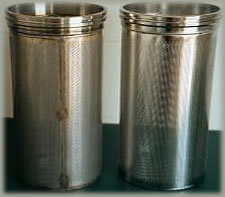 Electropolishing is an ideal polishing method in a number of areas. For details on how electropolishing works, read here. For instance, fragile items that cannot be tumbled or mechanically polished can be electropolished. Machined mating parts last longer and operate smoother when electropolished. Because electropolishing is a controlled process there is a minimal change in overall part dimensions. Electropolishing can control the removal of surface metal to within .0001'. This ability to control stock removal on fragile and complex items makes electropolishing ideal for microsizing. Stainless Steel that has a poor micro-finish, embedded hydrogen and carbon compounds and machined created stress can cause problems such as frictional resistance, critical leaks in assemblies, premature wear on components, allow bacteria growth and have a low resistance to corrosion. Electropolishing stainless steel can correct these problems while leaving part dimensions within tolerance. Electropolishing has a leveling effect on sharp edges, ridges, light scratches, & burrs. Electropolishing is ideally suited for processing parts in quantity to produce uniform size or weight. The microfinish is improved by a factor of 2 (20 Ra is reduced to 10 Ra). Cracks and other surface defects that act as stress-concentration sites are removed, improving the fatigue strength. This applies particularly to springs. Tests have shown fatigue life to be greatly increased after treatment. And electropolishing is super passivation. Parts have a smoother, cleaner, brighter, chrome-enriched surface. All surface impurities such as scale, rust, foreign debris, oils, grinding compounds, hydrogen, carbon compounds, iron and other materials are removed.